Just in time for the Big Game, DEVOUR is giving you the chance to win the ultimate man cave valued at over $8,000. 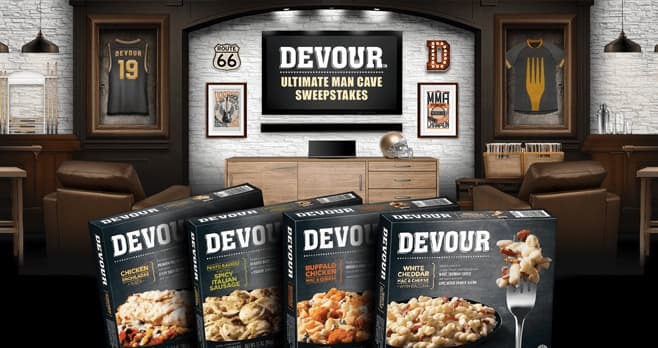 For your chance to win, visit devour-foods.com/sweeps and enter the Ultimate Man Cave Sweepstakes now. The DEVOUR Ultimate Man Cave Sweepstakes is open to all residents of the 50 United States and the District of Columbia, who are 18 years of age or older at time of entry. The Sweepstakes begins at 12:00 am ET on January 25, 2019 and ends at 11:59 pm ET on April 1, 2019. One (1) Sweepstakes entry, per email address/person, per day, during the Sweepstakes Period. The grand prize consists of one (1) LED Smart TV; one (1) TV Soundbar; one (1) Wireless Music System; one (1) LED Light Up Foosball Table; one (1) Tabletop/Bartop Arcade with 412 Games; $2,000.00 Wayfair gift card, terms and conditions apply; one (1) Mixology Bartender 10 Piece Bar Tool set; $1,500.00 Home Depot gift card, terms and conditions apply; one (1) branded freezer and one (1) year supply of DEVOUR products awarded as one hundred four (104) product coupons that expire April 30, 2020. Visit devour-foods.com/sweeps to enter and see Official Rules for details.